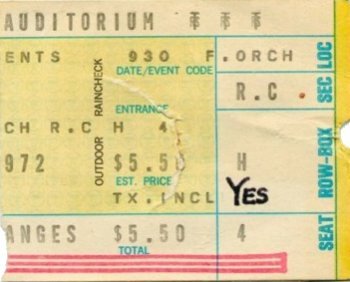 Someone posted this on Dimeadozen, and I thought you'd find it interesting for your website..
"My personal Holy Grail is Yes in Atlanta, 1972-09-30. There was a film crew at the foot of the stage at the beginning of the show. The band was wearing the same clothing as seen in YesSongs. They opened with "All Good People," and played their usual opener, "Siberian Khatru," at the end of the show. So where's that film? Where's the soundboard audio? Why didn't I bring a tape recorder to that show!!!" The 9/30/72 show was also at Atlanta Municipal Auditorium and the opening act was The Eagles (who I recalled were boo'ed a few times during their set) these two groups didn't belong together. Close to the Edge concert, Atlanta, September 30, 1972: the band walks on stage as the Firebird Suite ends. Jon sneezed, excused himself, then led the band into I've Seen All Good People. (They switched to opening with Siberian Khatru later in the tour.) I was dazzled by the sound quality, especially contrasted with the twangy opening set by the Eagles, and by the quality of the band's performance. The crescendo of "Sharp... Distance" blew us across the auditorium. Movie cameras were set up in front of the stage; perhaps footage of the Atlanta concert was included in the Yessongs film. Later, a mirror ball dropped from the ceiling as the opening effects built up to my first audition of Close to the Edge. I was transported.